Don't mention a movie for a few months, no matter how big the title, and it will quickly disappear from the public consciousness without a lingering thought. There has been no talk of Alien 5 in severally months, but director Neill Blomkamp has returned with an update. There is no huge news to report. The process is going very well. And we do get a new piece of concept art featuring some much beloved classic characters. But that's about it. It seems like back in March, when Chappie was coming to theaters, Alien 5 was the hot talk of the moment. A day didn't go by without new information leaking out. The director himself was keen on sharing plenty of Concept art. And we heard plenty about the possible story from both Neill Blomkamp and Sigourney Weaver, who were on their Chappie press tour at the time. We even heard a small bit of excitement about the project from Aliens star Michael Biehn, who seemed eager to return as Corporal Hicks. Though he has never been confirmed. Then Chappie floundered at the box office, and Alien 5 went radio silent. That's possibly because 20th Century wanted to distance one of its biggest sci-fi franchises of all time from a movie that, while it wasn't bad by any means of the word, really didn't catch on with the mainstream public. Though, during that time, we certainly did learn a lot about Alien 5, and what the story might contain. No specific plot details were ever outright revealed. And it sounds like the script has continued to go through changes. 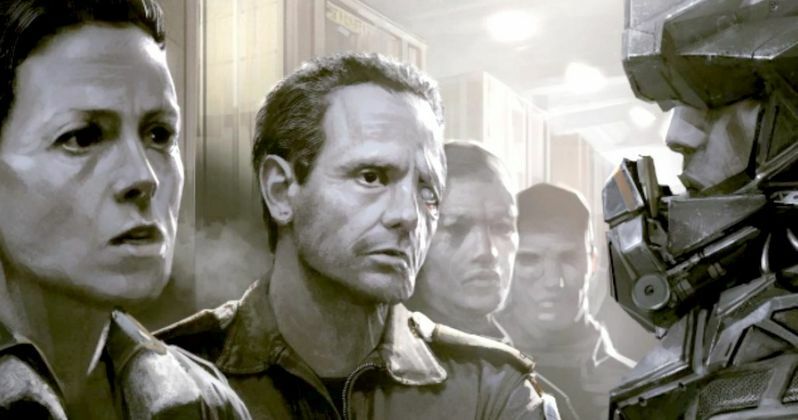 As evidenced in the new concept art shared on instagram by Neill Blomkamp, Alien 5 will follow Sigourney Weaver as Ripley and Michael Biehn as Corp. Hicks in a new adventure that serves as a sequel to 1979's Alien, directed by Ridley Scott, and James Cameron's 1986 sequel Aliens. No real plot details have ever been divulged by Neill Blomkamp, but he has stated that he is not completely wiping away the history seen in Alien 3 and Alien Resurrection. But it will not be directly tied to those movies either. About his progress on the project, he simply states the following. ""#alien going very well. Love this project." As of yet, Alien 5 does not have a set release date. It will co-exist with 2012's Prometheus, and that movie's sequel, Prometheus 2, which was originally planned for a 2016 release date, but might get pushed to 2017. Which means we might not see Alien 5 until summer 2018. Take a look at this latest piece of art, which is sure to get you excited with it's use of these classic characters. And then let your breath out. It's going to be a Comic-Con or two before we get the leaked trailer.